The Chip Shield Password Manager is part of the Web Assistant and provides a simple and secure way to manage all of your online accounts. The Password Manager can learn your existing account passwords, or create unique passwords for each site so that a breach at one site does not impact your other accounts. Your passwords are protected with your chip card’s security key and can only be accessed when your card is inserted into the Chip Shield Reader. The Chip Shield Password Manager can work with any site where you’ve created an online account, including internal company web sites. Once it is set up, you don’t need to remember which login and password goes with each site since the Manager tracks this automatically. To train the Password Manager for a new site, simply put it into “Learn” mode and the Manager will extract your login and password from the page and store it for you automatically. 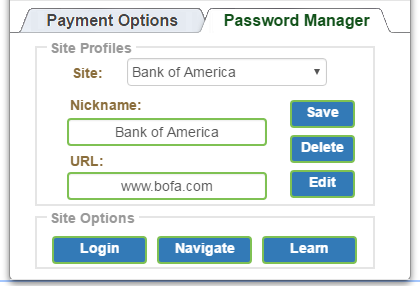 The Password Manager stores your login information on our central computers so you can log into your accounts from any computer or smartphone with a Chip Shield device attached. Normally, storing passwords in the cloud can be risky and would require a complex master password to unlock your password store. With Chip Shield, your passwords are protected using your chip card’s encryption key and can only be unlocked when you insert your card into the Reader and enter an optional 4-6 digit code. Chip Shield allows you to link multiple chip cards to the same account for cases where you share password access with another person, such as a spouse. Linking additional cards to your account is also useful to recover your passwords if your primary card is lost or stolen.